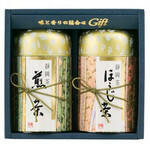 A beautifully packaged gift item including a can Gyokuro - the highest grade of green tea. Health Benefits of Green Tea Green tea contains a lot of natural antioxidants that combat free radicals and have a wide range of health benefits. Over the last few decades green tea has been subjected to many scientific and medical studies to determine the extent of its long-purported health benefits, with some clinical evidence suggesting that regular green tea drinkers have lower chances of heart disease and developing certain types of cancer. Green tea has been claimed to be helpful for atherosclerosis, lowering cholesterol, reducing cancer risk, inflammatory bowel disease, diabetes, liver disease, weight loss, neurodegenerative diseases, and even halitosis. You can read more on the health benefits of green tea on wikipedia. 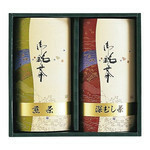 (It's worthy to note that Japan has the longest life-expectancy of any country and we all drink green tea!) 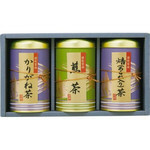 Types of Green Tea At the pinnacle of the green tea hierarchy presides the Gyokuro, which is made from leaves that are painstakingly grown in the shade away to produce a distinctly rich flavor. 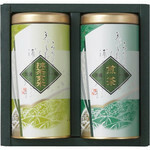 Then there is the more common Sencha which is what most Japanese drink on daily basis. It usuall has a strong, somwhat bitter flavor with varying aroma and richness depending on how long it is steamed during the production process. The variety used in the Japanese tea ceremony is Matcha, which is a milled, powdered form of one of the higher grade teas. It typically has a characteristic bitter-sweet taste. Also considered to be the healthiest form of tea because the entire leaf is consumed rather than just the infused liquid. Explanation on many more types of green tea can be found on the Wikipedia list of Japanese green teas. Brewing Although it's sometimes referred to as "brewing", the process of making tea is actually called "steeping". Usually you would use about 2 grams of tea per 100ml of water, or about one teaspoon of green tea per 5 ounce cup (150ml). So a 100g pack is good for about 50 servings. Sometimes double this amount may be used especially with very high quality teas like Gyokuro, which also needs to be steeped steeped multiple times for short durations. Most commercial "Green Teas" in the West contain sugar. 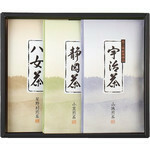 But the Japanese drink green tea without any additives, enjoying the intrinsic aroma and flavor of tea itself. How you enjoy your tea is totally up to you, though. Starbucks Japan even has a Matcha Latte which tastes quite awesome. Although green tea is not a common allergen please consume at your own risk. Seek the advice of your physician if in doubt.